Last night’s match between the Jin Air Green Wings and world championship runner-up SKT T1 was not a quick or quiet affair. The best-of-three went the full series, culminating in a 94-minute finale that was both maddening and fascinating. 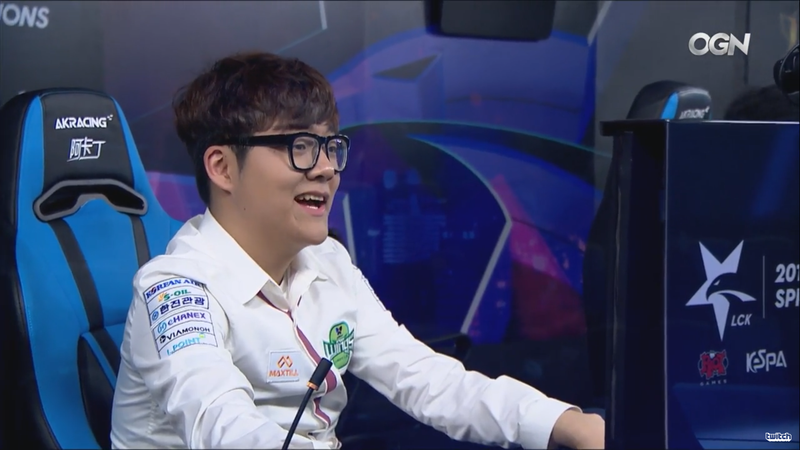 SKT T1, often lauded as one of the best teams in the game, found a tough match in Jin Air. The Wings’ bottom lane, Park “Teddy” Jin-seong and new addition Kwon “Wraith” Ji-min, carried the bulk of the load as the teams battled through games 1 and 2. But at game 3, with the series on the line, SKT looked poised to win. Teddy was the last line of defense, pushing back minions and enemy heroes with his unmovable Sivir. Most pro games of League of Legends hover in the 20-to-40 minute range, extending longer or shorter depending on the disparity between the two teams. A great team and a not-so-great team? Done and over. Two great teams? Might take a while. Most advantages in League of Legends are secured off the back of mistakes, so if neither team is making them (or actively avoiding risk), games can stretch out for a long, long time. As wave upon wave of minions dashed against the rocks of each team’s base, the CS (or creep score, the number of neutral AI a player has killed for gold) kept rising. SKT and Jin Air were locked in a stalemate, a game of inches where each could land blows but none seemed fatal. One commentator noted that the second-most CS in the game was 400 behind the leader—and yet both had broken the all-time record for CS in a single game. By the end of the game, Teddy’s 1465 creep score handily beat the previous record of 946. But it wasn’t just Teddy. Wraith brought some big plays in his support role as well, dropping a Redemption on Lee “Faker” Sang-hyeok of SKT T1 while he wasn’t paying attention. For non-League players, Redemption is an item with a massive range that forms a circle on the ground. After a delay, enemies in the ring are damaged, while allies are healed. Faker had retreated to a bush and hit his teleport-home button, and was probably window shopping for his next big item when Wraith made the smart play and dropped a Redemption on him. The game that seemed like it might go on forever finally ended when a pick-off of Faker opened just enough of a window for Jin Air to push into the SKT T1 base. With 30 seconds on the clock until Faker came back, Jin Air went for the game winner and succeeded, toppling the giant and ending the longest game at 94:37.